Are you a seeker or just someone interested in learning more about the Orthodox Christian faith? 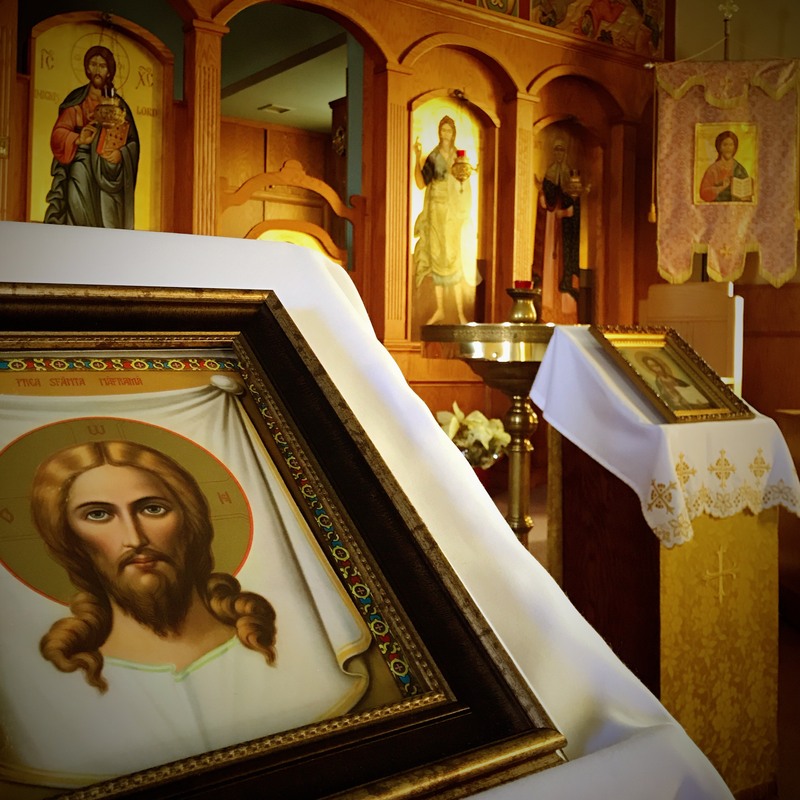 Below we answer some frequently asked questions about Orthodox Christianity and provide links to additional resources. Have a question we haven’t addressed? Send us an email. The heart of Orthodox salvation is "theosis" or godliness—a life of communion with God. In theosis, we become more like God through His grace or divine energies. It is a process nourished by the sacraments of the church and the spiritual disciplines, including prayer, fasting, almsgiving, study, and virtue. The life of holiness is, above all, a life of humility and love (the two greatest virtues). The divine energies, working through the glorified body of Christ, interpenetrate and transform us into His glorious image (icon). Christ truly becomes the illumination of our souls and bodies. Why are there so many icons in your church? Icons teach and portray the life and ministry of our Lord, his mother, the apostles, and the beloved saints of the church. They connect us to the past just as photos of our departed loved ones enable us to perpetuate their memory. And so we treat them with great affection and reverence, holding them up as examples of faith and love. Icons are also windows into heaven. Those who have died in Christ continue in His glorified life even now. Iconography represents them in their glorified state and invites us to participate in their glory through a life of love and holiness. Why is Orthodox worship so different? The Divine Liturgy is often called the "worship of heaven" because it mirrors the heavenly worship revealed in the book of Revelation and the Old Testament temple. It is the worship of the One, Holy, Life-Creating Trinity in true humility and holiness, and the eucharistic celebration of Christ's cosmic triumph over sin and death. Because Orthodox beliefs are passed down organically through the church's liturgy, our worship is theologically and historically rich beyond words. It touches all of the senses through music, chant, prayer, art (icons), incense, and sacraments (mysteries). Is Orthodox Christianity Catholic or Protestant? Actually, neither! Holy Orthodoxy is the third major division of Christianity which predates the Roman Church and the Protestant denominations which grew out of it. Though our worship resembles the Roman Catholic mass in some ways, the Orthodox Church differs from Catholicism. Our spirituality has a different emphasis (see below), our church is governed only by only local bishops (we do not have cardinals or a pope), we do not accept the doctrine of purgatory, and our priests may marry. There are other important spiritual and theological differences as well. What does Orthodox Christianity teach? In a word, the love of God! Jesus took upon Himself our burden of sin by His death on the cross. And, by His glorious resurrection, He conquered death itself and defeated the powers of evil. The mission of our church is to offer this life and salvation to all. The Orthodox Church is a place where repentant and broken people humble themselves before God's mercy to receive healing of both soul and body as they strive to live holy lives. Orthodox theology is embodied in Scripture, the ancient Councils, the Nicene Creed, worship, holy tradition, the writings of the church Fathers, and art. Though Holy Orthodoxy is unfamiliar to most Americans, it is the dominant expression of Christianity in Russia, most of Eastern Europe, the Balkans, and the Middle East. Orthodoxy first came to North America in the late 1700s and slowly spread across the continent.